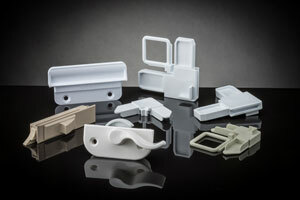 As a leading authority on plastic injection molding, at The Rodon Group we are accomplished problem-solvers. A major manufacturer of doors and windows approached us about supplying some residential window hardware that they were currently producing in-house. Nearing its end of life, their tooling was producing parts of diminished quality, and they were seeking a value-based solution for future production. We took the time up front to analyze the prints and samples in terms of each part’s functionality and manufacturability. Using injection molding-specific design software, we re-engineered the parts to improve performance and reliability while also focusing on optimizing the molding process. We took into consideration aspects such as cycle times, material usage, and other process requirements to ensure products conformed to ISO and AAMA standards. Our re-design involved building new, multi-cavity molds to yield a high rate of conforming product at a lower overall cost. Production involved the use of four different materials - nylon, vinyl, polypropylene, and polycarbonate - specified based on the individual performance requirements of each part. Using shot sizes as small as 0.03 grams and as much as 20 grams, injection molding took place on one of several energy-efficient presses in the 46 to 233-ton range. Finished parts measured in size from 3/8-inches in diameter to 4-inches square and featured both glossy and textured finishes. Quality control involved first piece inspection as well as in-process and final inspections to ensure we upheld ± 0.005” tolerances and satisfied all other quality criteria. The ability of our experienced professionals to work with this customer provided them with a better hardware at reduced cost and added overall value to their residential window product line. Our experienced professionals work with customers to create or refine their production process for maximized productivity, performance, and value. 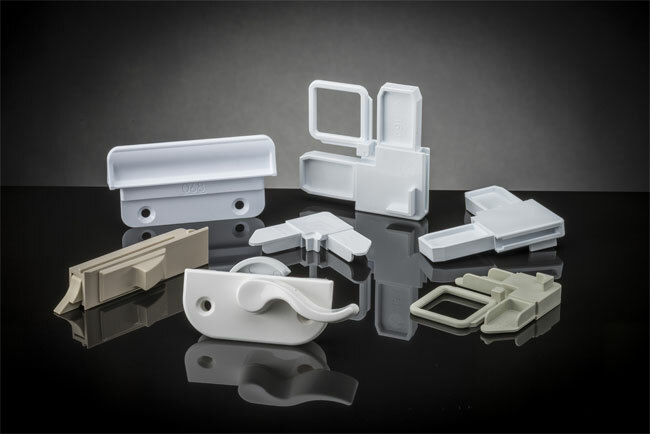 For more information about this plastic injection molded window hardware project, or the other high volume plastic injection molding capabilities available, please see the table below or contact us directly.